Wounded Warrior Anglers – American Military Veterans Foundation, Inc.
American Military Veterans Foundation, Inc.
A good student, Pete Paskewicz graduated third in his class with aspirations to continue onto college. Unfortunately with the expense of enrolling and lack of guidance, his focus changed. He began working as an assistant pro at a golf course learning the game. A man that made an incredible impression upon Pete filled his thoughts changing his line of thinking. When Pete saw “U.S. Declared War on Iraq,” in the newspaper, he said goodbye to his boss and enlisted in the United States Marines. Participation in a training exercise, running across roof tops and buildings, left Pete injured. He had shattered his hip and broke a piece of his vertebrae in his back. After his injury he became a payroll clerk. That was how Pete continued to support his guys overseas – through financial means. The advice changed Pete’s direction. He decided to pursue a history major. During his schooling, he began having marriage problems because his wife thought he was failing. Pete soon thereafter became a single father of three children. Eleven years later he met a woman who he ended up marrying. This woman transformed his life by providing him encouragement, as well as never leaving his side. After his life started taking a turn for the better, Pete sustained another injury to his lower back, which resulted in 100 percent disability. 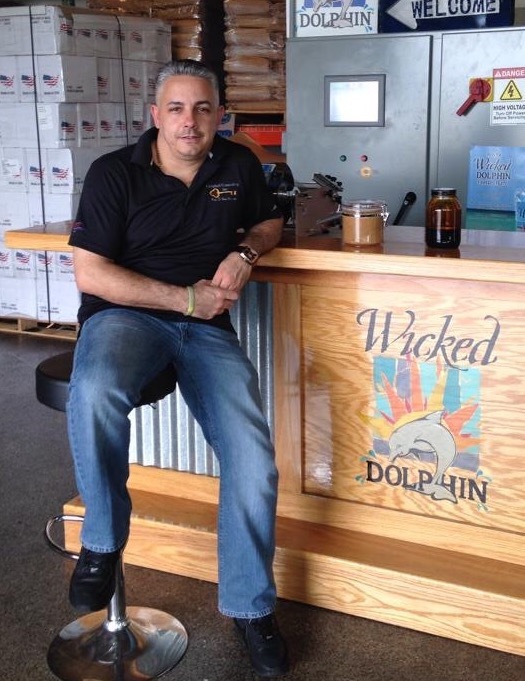 In 2013, he was introduced to WWA after visiting a local bait shop when the founder was also in the store. At the time he learned about the organization, he was taking 180 milligrams of morphine a day for pain, as well as muscle relaxers and other medications. 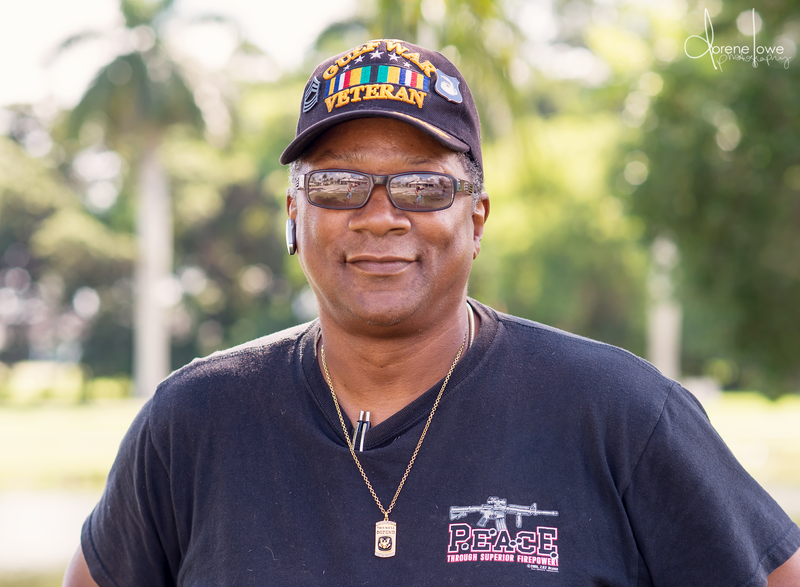 He found a civilian doctor, Dr. Frey, in Cape Coral that changed his life. After the doctor completed a back procedure, Pete felt completely transformed because his body felt good for the first time in years. Shortly after that, Pete and his wife were invited to a Warrior & Caregiver Retreat, which he agreed to attend because he was feeling so well. On the second cast, the following day, Pete caught a trout, deeming the day a complete success. While Pete was fishing, his wife was enjoying a day of pampering at Spa 33. The day was a turning point for the couple. When Pete is struggling with PTSD he turns to fishing and wood carving. Since Pete joined the organization 2 ½ years ago, he has become a changed man, a positive man, a man of growth who wants to help as many as he can. Photograph courtesy of Dorene Lowe Photography – a Southwest Florida photographer out of Punta Gorda, Florida. To view more of her photographs, visit https://www.facebook.com/dorenelowephotography, or to schedule a session, call (941) 467-5015. Article written by Meghan McCoy, Wounded Warrior Anglers media director. Bentley, born and raised in the projects of Manhattan, enlisted in the United States Army at the age of 19. He served in the infantry for 21 years out of his 39 years of service. During his service, he was deployed to Iraq in 2003 and Freedom 2.1 for a little more than a year. Bentleys service, also led him to working Ground Zero, an experience that is hard to share. For four years he served in the light infantry before he was promoted into communications due to an injury during a training exercise. Instead of doing communication, Bentley did transportation while deployed. During that time, Bentley was working 18 hour days, sleeping a maximum of six hours. The extreme temperatures were hard to adapt to, especially with temperatures reaching over 140 degrees after first arriving in Kuwait. Bentley had to remain in full gear walking the base, often times resulting in carrying around more than 100 pounds. When the temperatures hit that high, the commanding generals limited their time on the fire base for no more than 30-mintues to an hour. Unfortunately he saw first hand what could happen. Bentley was treated for heat exhaustion even though he refilled his water bag often and suffered an injury after falling 8 feet from his bunk while sleeping. Deployments can be hard for a family, especially when leaving behind three children. He promised his family he would be okay and was able to Skype with his family often, which helped tremendously. Bentley enjoyed serving his country, the camaraderie of being with all different walks of life and rubbing elbows with people from across the globe. March 30, 2015, Bentley moved to SW FL in an attempt to escape the bitter cold of New York. He stumbled upon Wounded Warrior Anglers and instantly felt as if he was back in the military again. Even with pains and images that are sometimes hard to escape, Bentley remains positive, often times flashing a huge smile. A vision imagined more than six years ago became a reality earlier this week when the founders of the Wounded Warrior Anglers of America signed lease papers for their new world headquarters and training facility on Pine Island Road in Cape Coral. “To see it come to fruition is more than amazing. We will continue helping veterans and changing lives, one warrior at a time,” vice president and co-founder Judy Souders said. The 1,600-square-foot facility, which currently has no interior walls, will include a reception area, two offices with ample privacy, a storage room, a custom rod and reel display area, a rod building workshop outfitted with Renzetti equipment and approximately 500 square feet designated to a multi-purpose room. 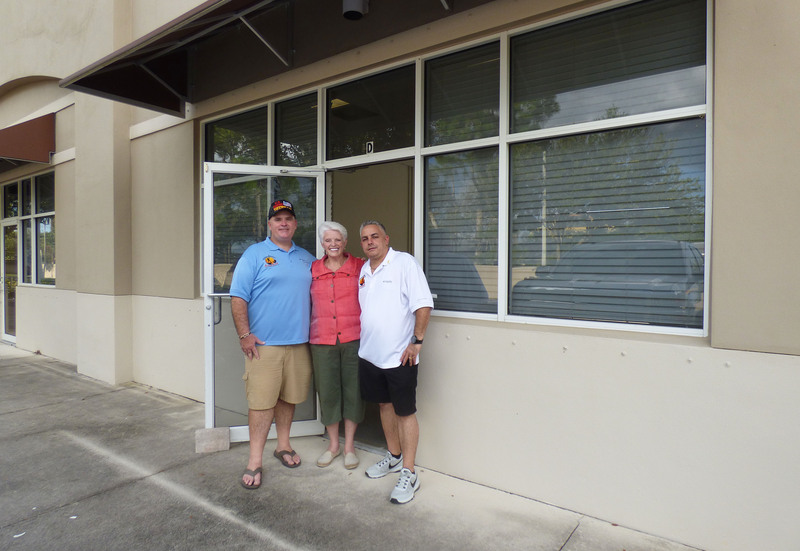 Wounded Warrior Anglers of America President and Co-Founder David Souders, Vice President and Co-Founder Judy Souders and Board Member Keith Campbell stand in the doorway of the new Wounded Warrior Anglers of America Headquarters and Training Facility. The organization is in the process of getting a contractor in place to pull the permits needed to complete the space. Many business members of the community have already stepped forward to donate their skills, time and material to duplicate the Souders’ vision. Jeff Asbury is donating all the building materials for the project from Coastal Building Material, and Chuck Chatter with 180 Painting offered to do the painting for the facility. “This place would not have been possible without the help of people like Seafarers International, Miceli’s, Beavertail and Nautic Star. Those are our key strategic partners,” David said. Board member Keith Campbell said when they have the permits in place and get everyone on the same schedule, the build-out should take three days at the most. Many of the veterans affiliated with the organization have already offered a helping hand throughout the construction process. There are many items the organization is in need of once the organization settles into the new facility, such items as nice, welcoming, matching furniture for the two offices; four computers; printers; a phone system; a point of sale system; chairs; stools; two drying stations for the rod building; and a display counter. One of the two office spaces will be used by certified veteran services officers. David said they are going to start with having two VSOs, one of which is Campbell. Campbell said he wants to become certified, so he can help veterans at a higher level. There is a national certification a person has to take through the Department of Veteran Affairs to become a VSO. After purchasing the books to become certified, people can go through the process as quickly or slowly as they chose, as long as they complete the testing within a year’s time. David said once the individual passes the certification test, Wounded Warrior Anglers has to apply as a nonprofit organization with the certified veteran service officers at Veterans Affairs to become a patient advocate and VSO. “Anybody can help a veteran, but being a certified veteran services officer means you have access to the VA system and access to the VA computers. It makes it easier and better for the veteran,” he said. 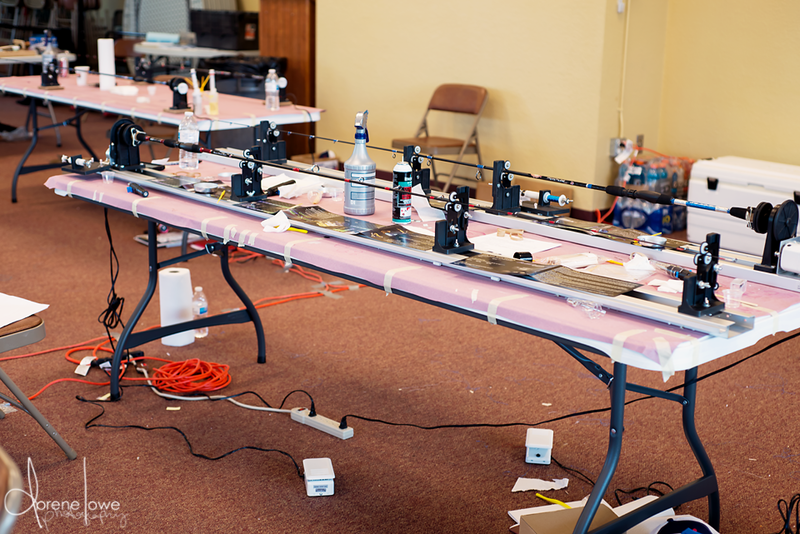 The multi-purpose room will be utilized for the national board meetings, rod building workshops, the raffle boat when activities are not going on and a gathering space for educational programs and entertainment. The facility will also have space for custom rods and reels, the production line, Mission 23 and the Wounded Warrior Anglers shirts. David expressed a great deal of excitement regarding the endless possibilities the new facility will have for its members with one of its programs – rod building. He said they will eventually have a window of time blocked out for the members to stop by the facility and work on their custom rods. “As long as they are buying their equipment, blanks and material from us, which will actually help fund the organization, and they are a member, they are going to be able to come in and have access to use it,” David said. In the future, he hopes to block out time for eight days every two weeks. The other four days will be used to work with two new warriors teaching them how to build their own rod, followed by a fishing trip using their custom rod. An open house will be held in the near future, which Judy said the public and their partners are more than welcome to attend. Once the interior walls are up and furniture is brought in for the offices, the facility will open with regular business hours. The headquarters is located at 1490 Pine Island Road, Unit 5D. For information, call (239) 257-3410. Wounded Warrior Anglers of America (WWA) treated some of its warriors and caregivers to a weekend of relaxation and pampering Friday, Sept. 24, through Sunday, Sept. 26 as part of its Warrior & Caregiver Retreat program. The warriors received a rod and reel combo at a special ceremony held during a captain’s dinner at the Olde Fish House Marina in Matlacha. The fishing rods were used the following day while they spent many hours out on the water fishing. 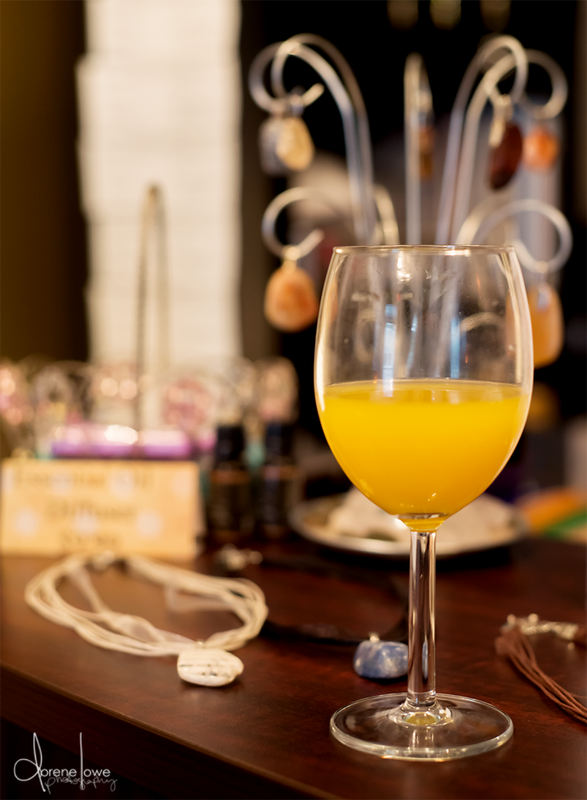 Their wives and caregivers spent the day at Spa 33, a business that closes its doors for the day, in Matlacha where they were treated to mimosas, chocolates, massages, facials, hair and make-up. 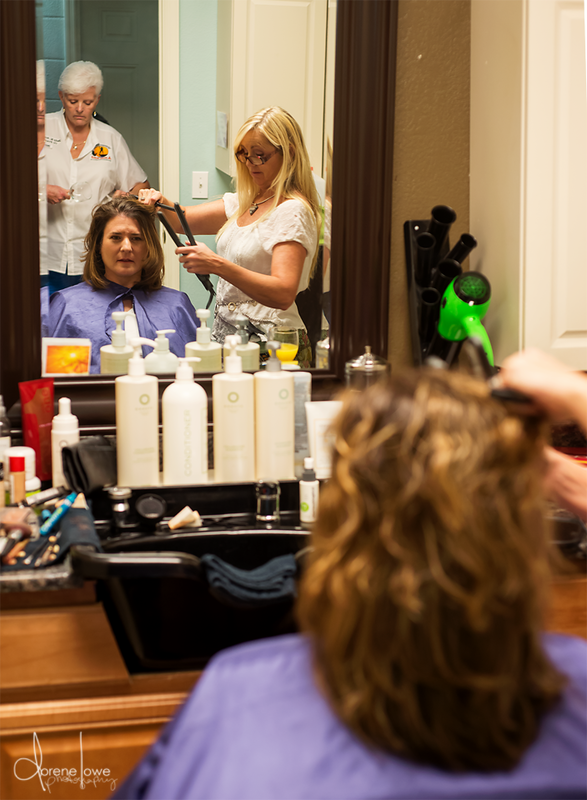 The day of pampering is held in honor of our caregivers because they are “the strongest fiber of our nation,” said Judy Souders, vice president of WWA. Alicia married Danny 13 years ago and now has three beautiful children – an 11, 9 and 5 year old with her husband who she met in high school. The life of the Beesting’s forever changed when Danny enlisted and dedicated almost 10 years to the United States Air Force. In 2004, Danny deployed to Iraq for six months leaving behind his wife and then 8-month old child. “He came home. He was okay. Not 100 percent, but okay,” Alicia said after her husband returned from his first deployment. The deployment was hard for Alicia who was in Alaska at the time, even with a great support group of other military wives. Their daily lives were normal until 2009 . . . their family had grown and Danny crossed trained into intelligence. Danny did aerial surveillance on the Reaper for three years. During this time, Alicia began seeing some major changes in the man she loves. Alicia watched her husband remain in war mode 24-hours a day, seven-days a week for three years. With Danny being on flying status, his shifts were sometimes put on hold for 12-hours if there was a sandstorm. Alicia kept in touch with the other Air Force wives, but often times they all had their own lives and children to care for. 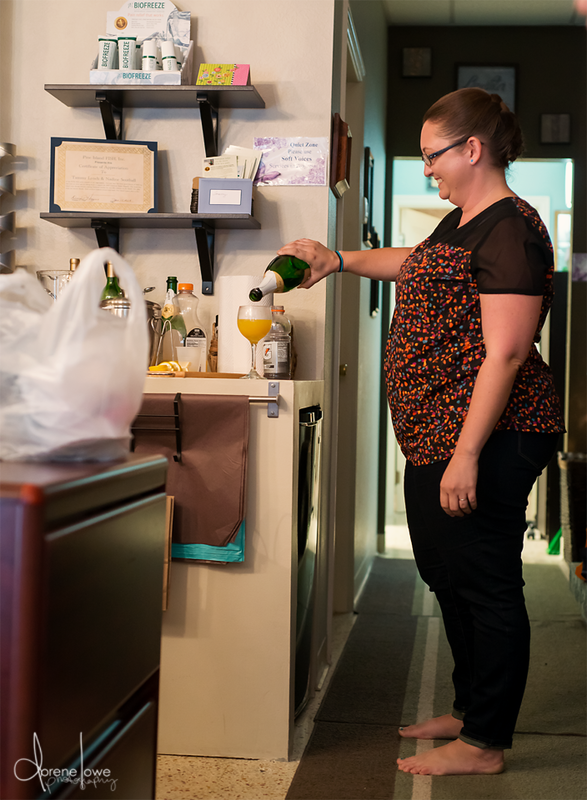 She said although they tried to find as much time as they could to gather, it was not the same kind of support she received while living on base. The only way Alicia was able to cope while her husband was in the service, was to live without him. Four years ago Danny retired from the service, which was a hard transition for the entire family due to the new adjustments that took shape. Danny tried pushing his wife away, but Alicia remained strong and told her husband she was not going anywhere. That unconditional, pure love led her husband to doing cognitive PTSD therapy as an outpatient with the VA. The therapy has helped her husband tremendously. “He is never going to be the man I married. So it is just learning the new things about him. Learning to deal with his issues and how to balance everything together,” Alicia said. With almost 10 years in the service, Alicia explained her husband to be “a hot mess” with his multiple injuries ranging from metal screws in his feet, torn muscles on his spine and coping with PTSD. Those injuries have resulted in Alicia taking on the job as a full-time caregiver, while still raising their three children and remaining all of their support system. Her girls, on the other hand, struggle with their father being hurt and away from home. The retreat did wonders for the Beesting couple. 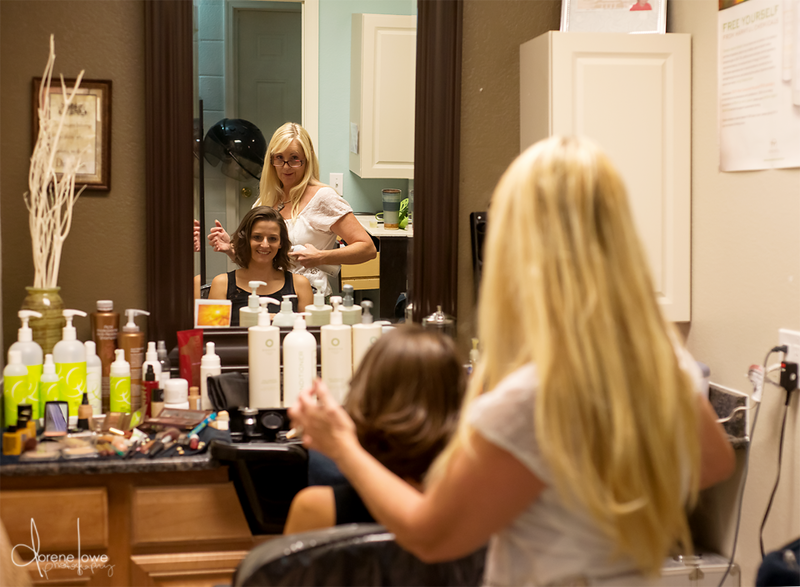 A day of pampering gave Alicia the energy to tackle another week – another week taking care of her children and husband. “ . . . knowing that I’m doing a good job. It’s easy to give up sometimes,” she said. 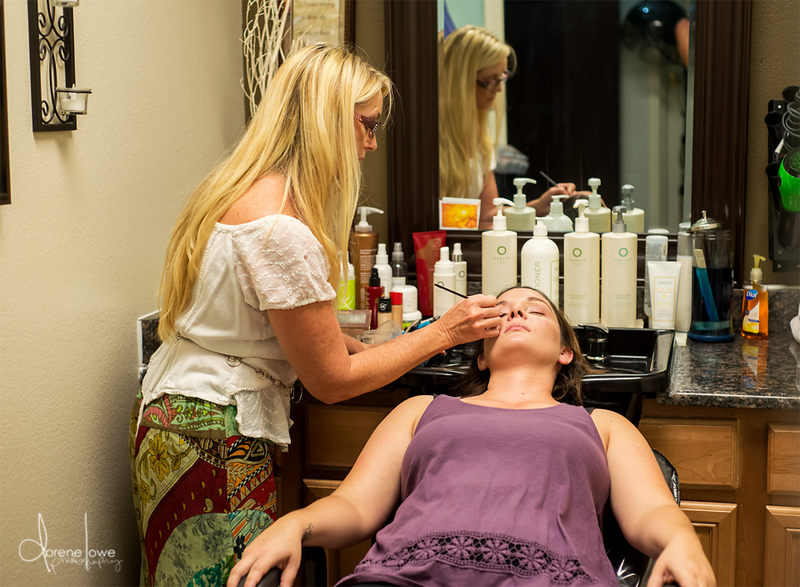 Although she loved being pampered, the retreat meant so much more to the mother and wife of three. The day meant that her husband, who now owns a fishing rod from the retreat, can spend time with his children fishing. It was not until Kristi married her husband Patrick that she began to form an understanding of the military. Kristi met Patrick through Match.com two or three years after he was out of the service. Within five months the couple was engaged. Since they grew to know each other after Patrick’s days in the service, Kristi said she does not know much, but that he was in combat and had to fire a gun. “I never saw what he went through, or that side of him,” she said. Patrick dedicated 12 years to the United States Army. For the most part Patrick left the service with very minimal injuries. 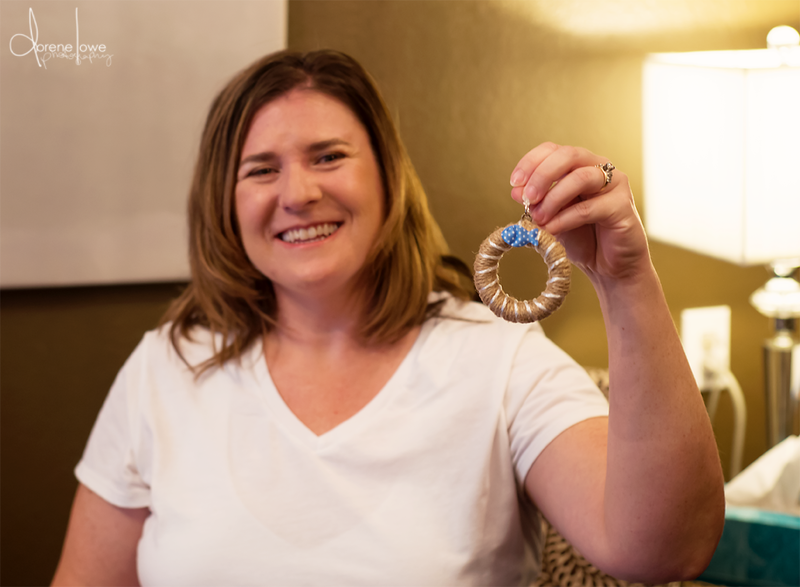 Kristi said her husband is completely deaf in his left ear and has battled severe migraines, some so debilitating they would knock him out for three or four days at a time. He had brain surgery for a benign cyst over his left ear in 2001, which has helped the migraines. Kristi said she does not consider herself a caregiver because her husband is very functional, able to work, and does whatever his heart desires. The only obstacle Patrick faces are the migraines that come every once in a while. 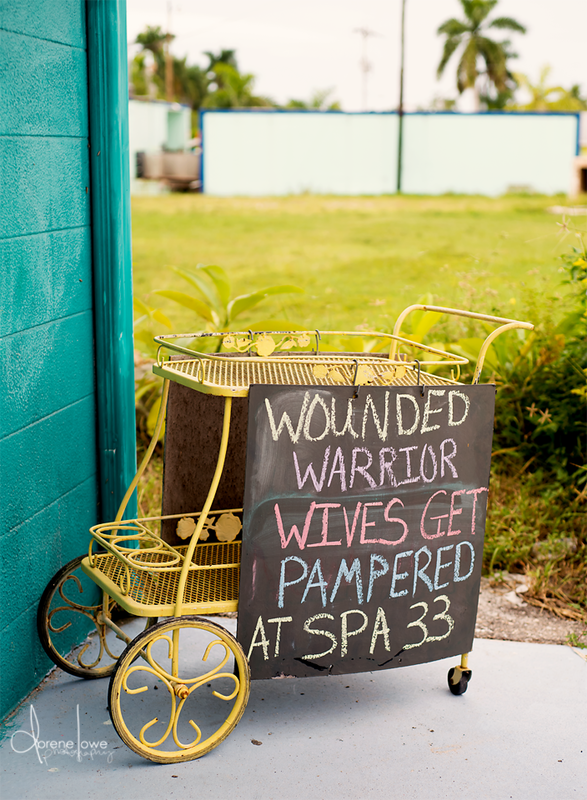 Kristi reiterated that the spa day was not only very relaxing, but comforting knowing that WWA touches the lives of veterans and their caregivers. On Oct. 16, Amanda married her husband Tyler, eight years ago after meeting him through mutual friends in a parking lot while he was in ranger school. Aug. 24, marked a year since Tyler’s left the Army. Amanda said that first year after getting out of the service was the hardest because he no longer had the job that he has had forever. Tyler, who served his country for nine years, was deployed twice. “It was difficult because I didn’t know what the military was at all,” Amanda said of her husband’s deployment. Tyler’s first deployment lasted for a year and the second only five months due to an injury the second week he was gone. Those injuries – a fused back and a good amount of nerve damage. She found some comfort with confiding in her friends and other military wives while the distance separated them. Although Amanda now lives close to her family, she still faces some challenges because not everyone understands why they cannot go certain places and do certain things. Now that Tyler is home full-time he is faced with new challenges – playing with their two girls, now 7 and a 3-years old. With his injuries, Amanda has become his caregiver, scheduling his appointments and whatever else he may need. The retreat was beneficial for the Crane family because it provided a break from everyday life. The day also made them focus on taking care of themselves while being surrounded by others who have gone through the same thing. “That is why fishing is his go to because he can mellow out,” Amanda said of her husband spending the day fishing during the retreat. The day at the spa was a treat for Amanda, one that she enjoyed thoroughly. Dana, who met her husband Shawn in middle school, tied the knot almost nine years ago. The couple became acquainted again after Shawn’s mother visited her grandmother’s house with his email address. When he returned from Iraq, Dana joined Shawn in Kentucky and got married a month later. The couple now has three young children. Shawn, who was in the Army for nine years, suffers from PTSD, traumatic brain injury, migraines and sleep apnea. Dana said while her husband was deployed, he was knocked unconscious briefly due to a car next to him containing an IED that went off. Since her husband has returned, Dana has become his full-time caregiver. Dana and Shawn are also full-time students, which throws another challenge into the mix. “There is a lot of stress in our lives,” she said. Dana is pursuing a science degree while her husband is still contemplating the exact direction he wants to take. 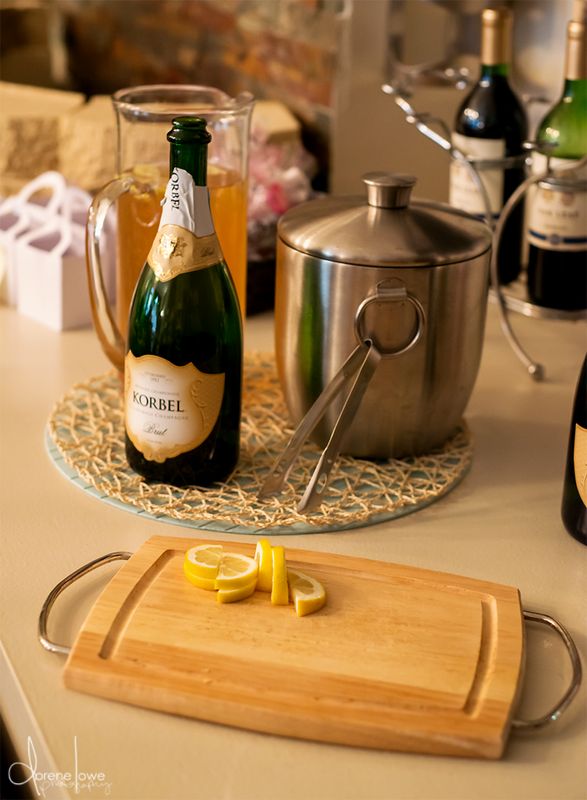 The day of relaxation was exactly what the couple needed. “I’m really appreciative of it,” Dana said of the relaxation and quietness she experienced that Saturday. 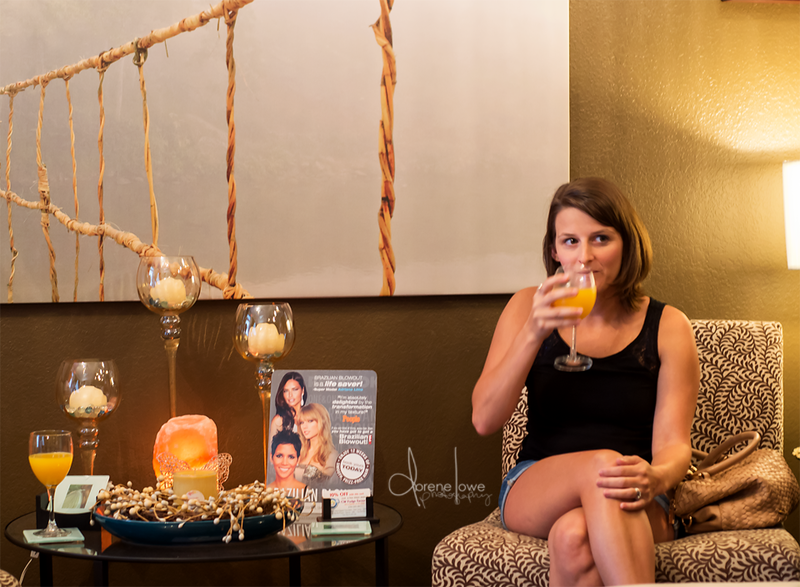 She said while sipping on a mimosa that the massage was among the most relaxing of all the services she had at the spa. Wounded Warrior Anglers is a nonprofit organization that helps rehabilitate the mind, body and soul of all service members who have been injured, wounded, or disabled in the line of duty no matter what their era of service. The organization also has a mission to actively support the wounded warrior’s caregiver and their immediate family. 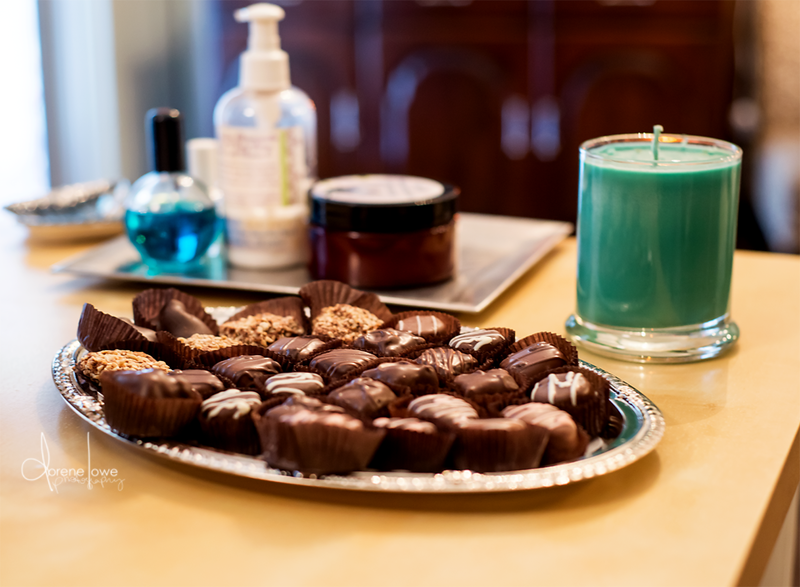 All photographs are courtesy of Dorene Lowe Photography – a Southwest Florida photographer out of Punta Gorda, Florida. To view more of her photographs, visit https://www.facebook.com/dorenelowephotography, or to schedule a session, call (941) 467-5015. 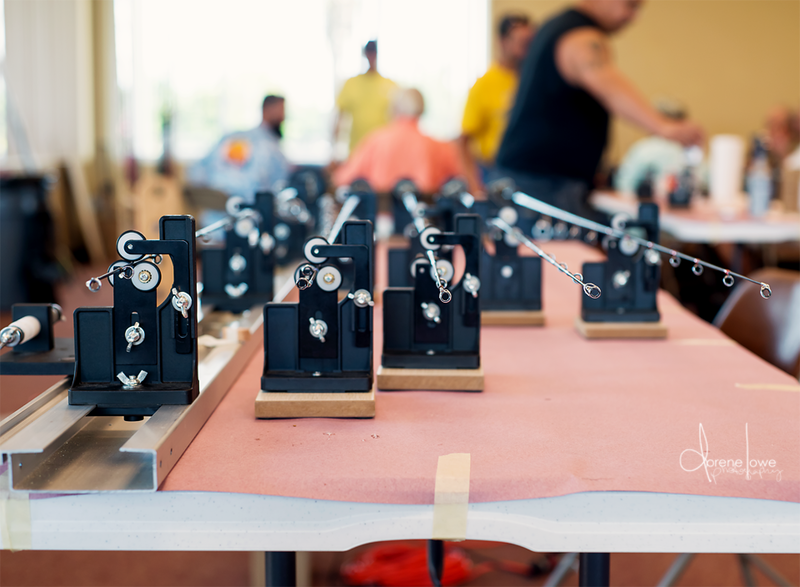 The Laishley Park Municipal Marina Community Room in Punta Gorda was transformed with rows of tables, as warriors were given the opportunity to learn a new skill – rod building. 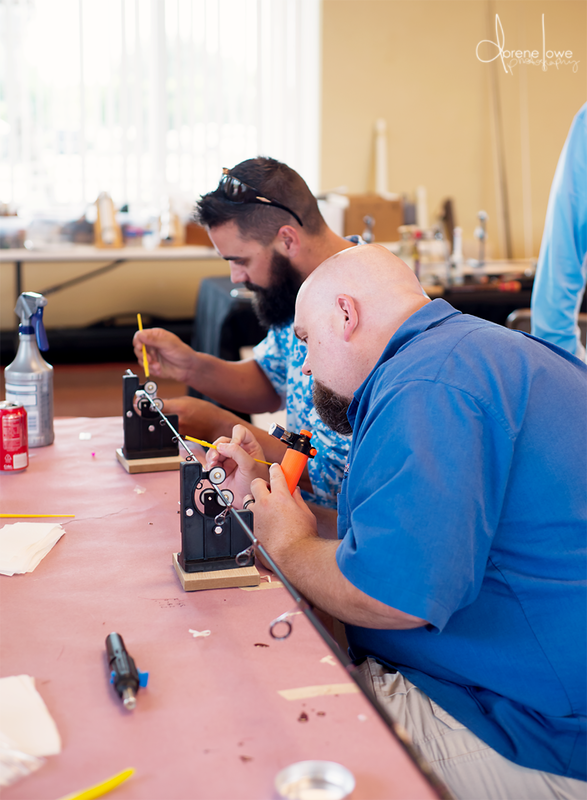 Wounded Warrior Anglers (WWA) held a rod building workshop Sept. 17, through Sept. 20 in partnership with American Tackle Company International. 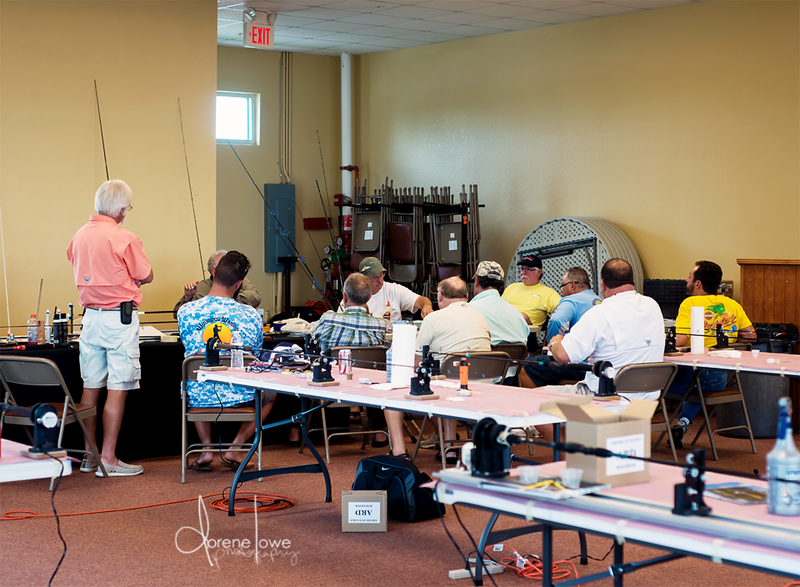 The two full days of rod building concluded with a half-day on the water fishing using the newly constructed rods. “There is nothing more exciting than catching a fish on the rod you built,” Don Morse, with American Tackle, said. 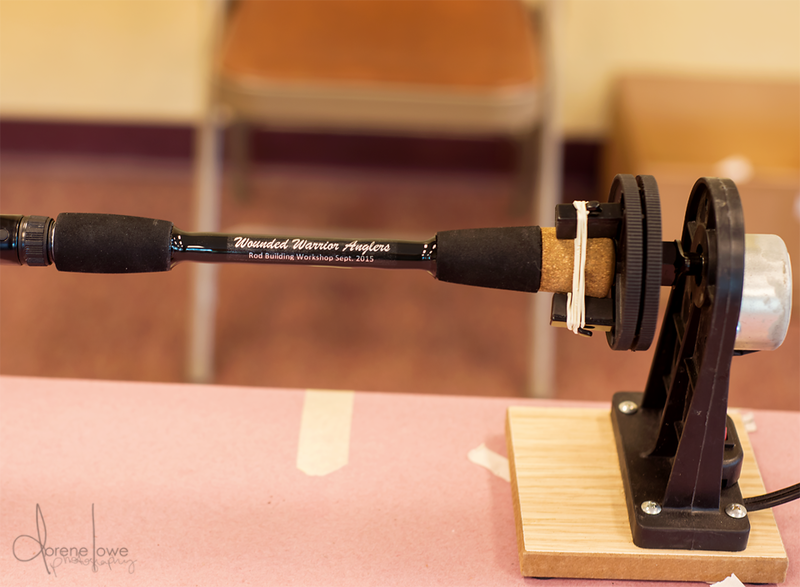 The nonprofit organization, Wounded Warrior Anglers, offered the first rod building workshop for its warriors earlier this year in Oviedo, Florida. Since it was a huge success, the four-day workshop has been added to the many programs the organization offers for its warriors. Morse said the company wants to promote rod building in any way they can. When the opportunity to work with Wounded Warrior Anglers presented itself, he said there was no better group of people to share the craft with. “I feel a strong connection with these guys,” Morse said of the warriors he has worked with. 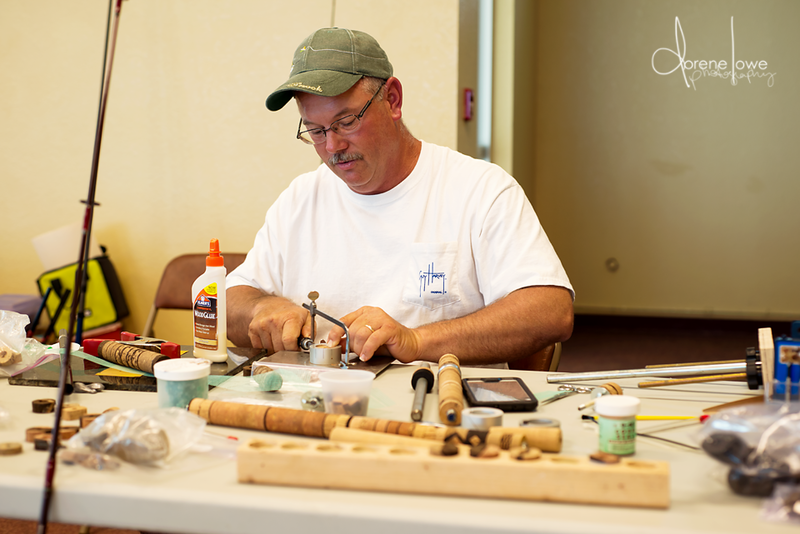 Although Mike Kosiba has been fixing rods since the 1960s, he found a passion in 1999 when he began creating custom fishing rods. 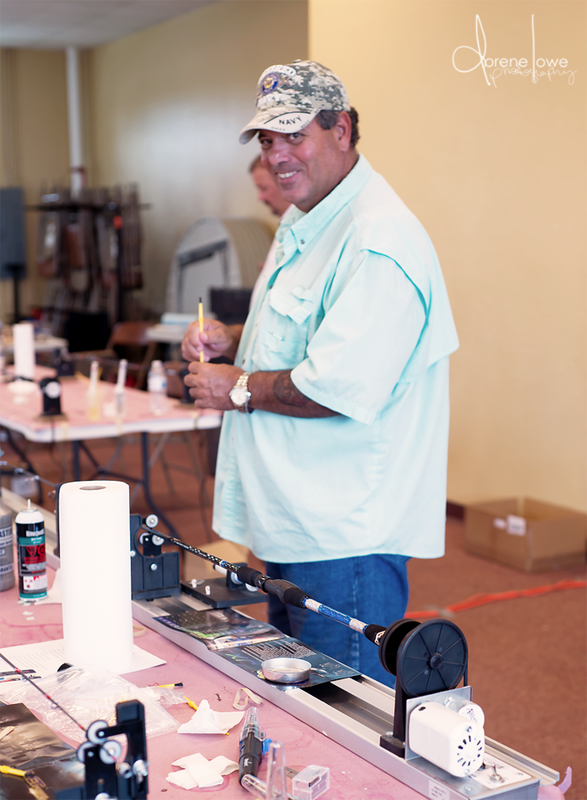 The seasoned rod builder spent time with 10 Wounded Warrior Anglers sharing secrets of his craft. Kosiba was joined by four other instructors, all members of the group Mosquito Creek Rod Crafters. 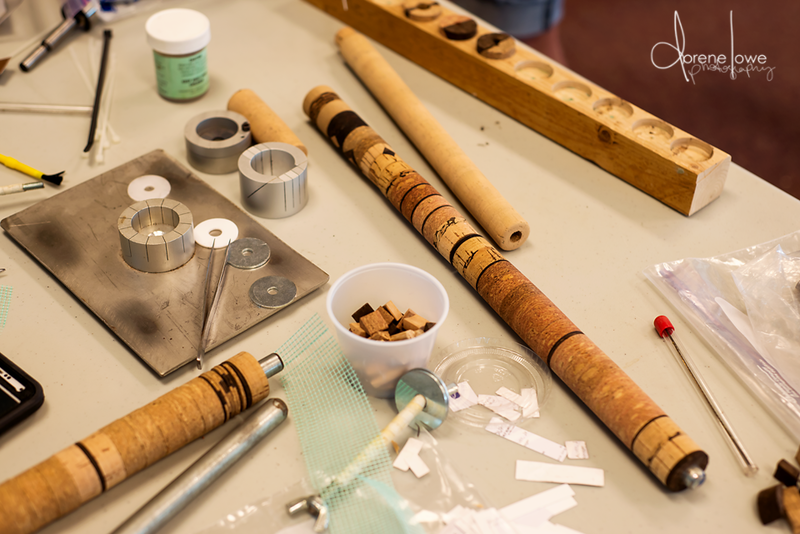 The process of creating a custom rod takes on many steps, all of which stem from selecting a blank depending on the type of fishing one wants to do. The next step, Kosiba said is deciding the dimensions of the rod to best fit an individual’s body type, followed by choosing the rod’s handle. Guides were then placed on the rod depending where the blank flexes to ensure its efficiency. 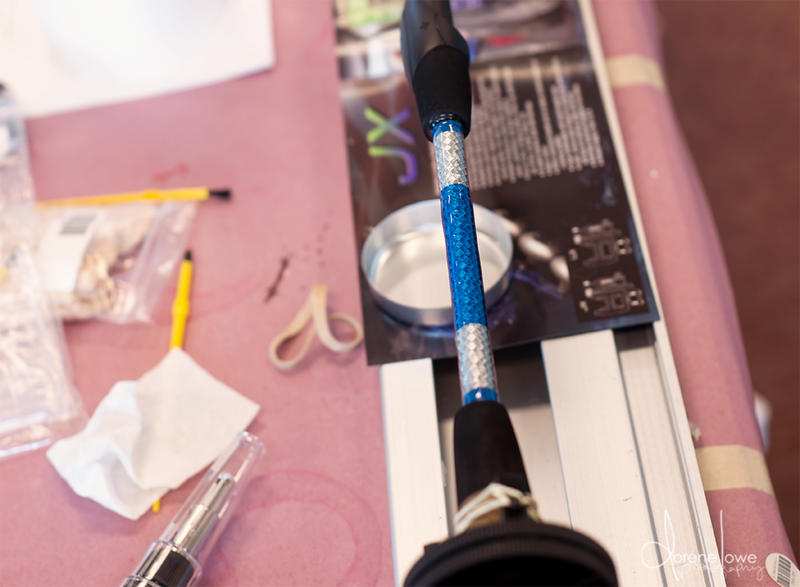 The guides are then wrapped with thread before an epoxy finish is placed on top. 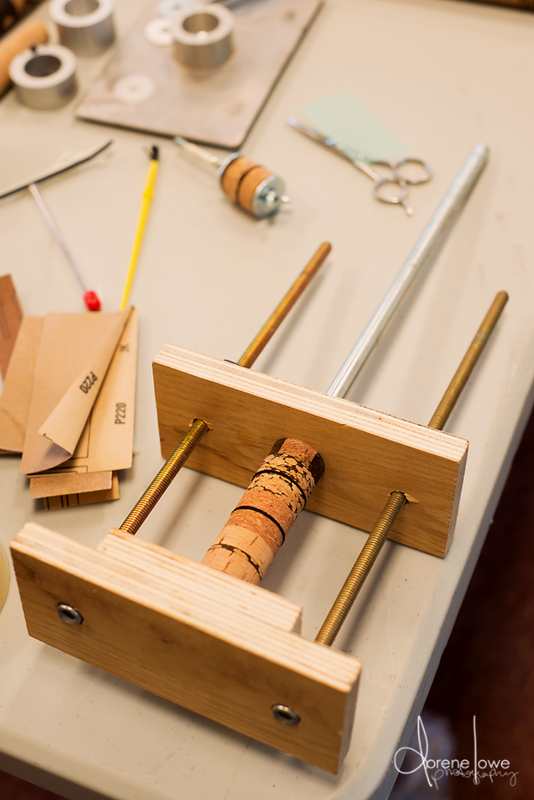 The craft of rod building, Morse said is both artistic and useful. The warriors were carefully walked through the process step-by-step, so they could create a rod they were proud of, a rod they could put to the test out on the water. “It’s something they can do,” Kosiba said, adding that the warriors can pursue it as much or little as possible. 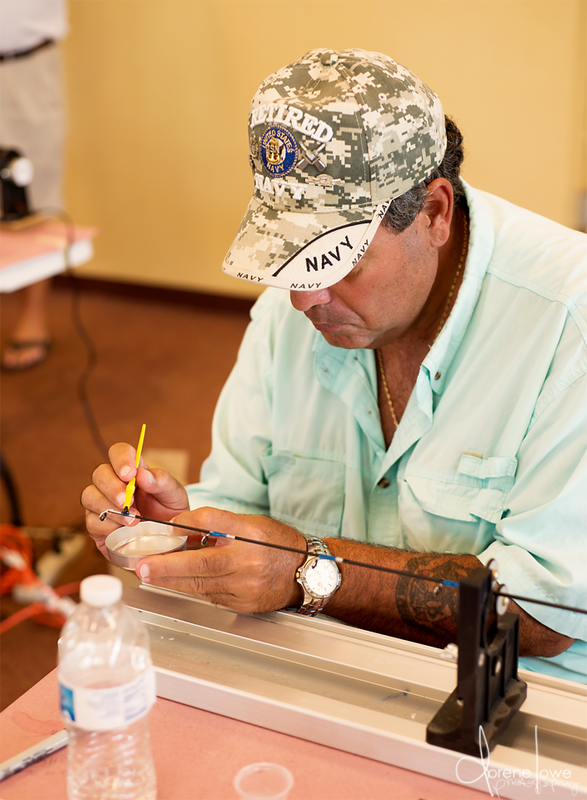 This is the second workshop for Wounded Warrior Anglers’ Tony DelleDonne. 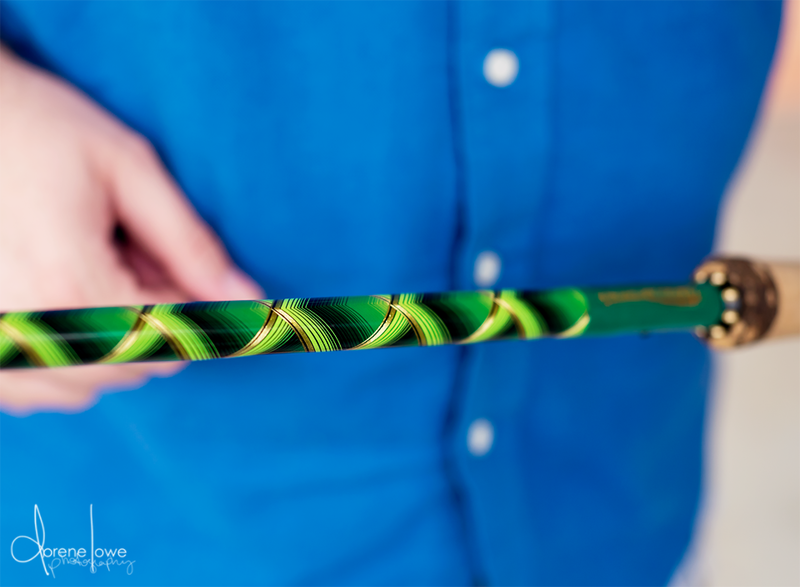 “I did a dragon scale on this one.” The style used dry wall tape, and metallic thread. 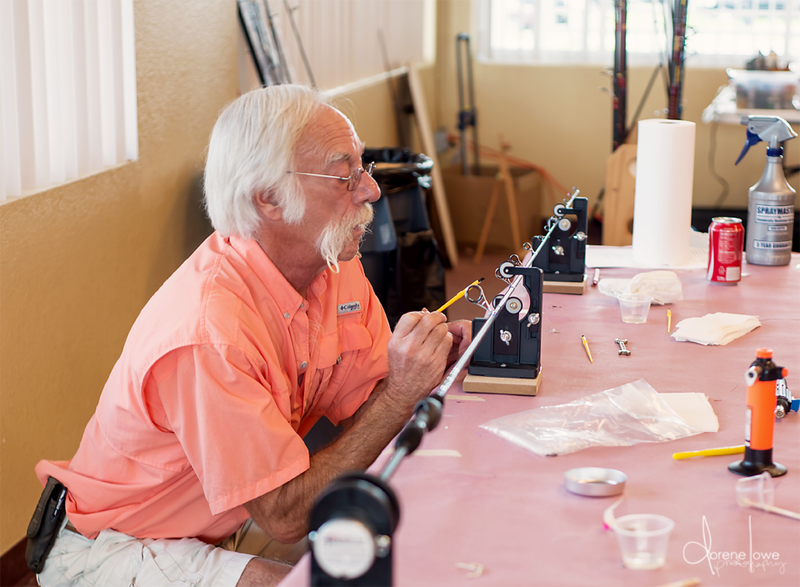 The workshop was very relaxing for DelleDonne as he continued to perfect his new skill. 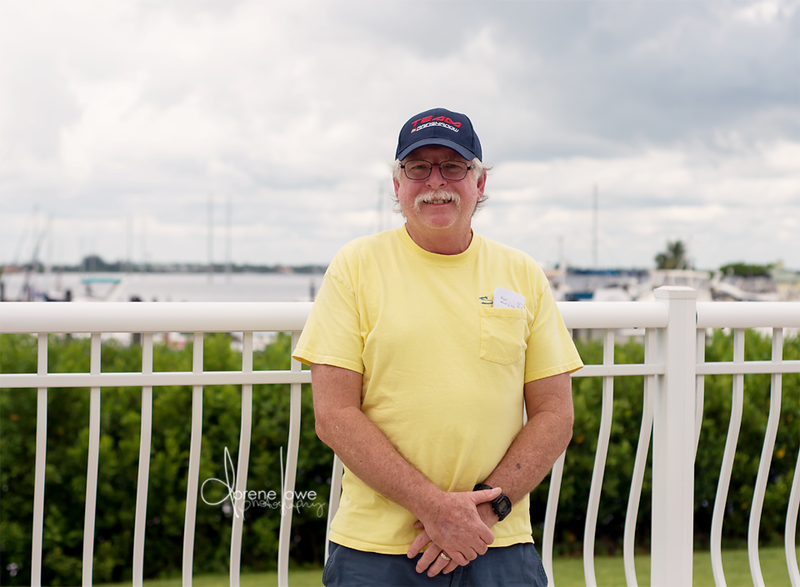 The 21 year Navy veteran, who retired in 2006, joined WWA a year ago after meeting founders David and Judy Souders, at the Fort Myers Boat Show. The workshop was also eye opening for the instructors. The workshops helped Jr Alvey slow down and think about what kind of impact teaching a new skill has for the warriors. “It’s a great way to give back,” he said. Alvey, who was also a part of the first rod building workshop, said he hopes to spend more time with the warriors in order to get to know them better. “The guys are invited anytime to visit and get one-on-one (instruction). We are just a phone call away,” he said. The passion for many of the instructors formed many years ago. Alvey fell in love with rod building eight years ago. 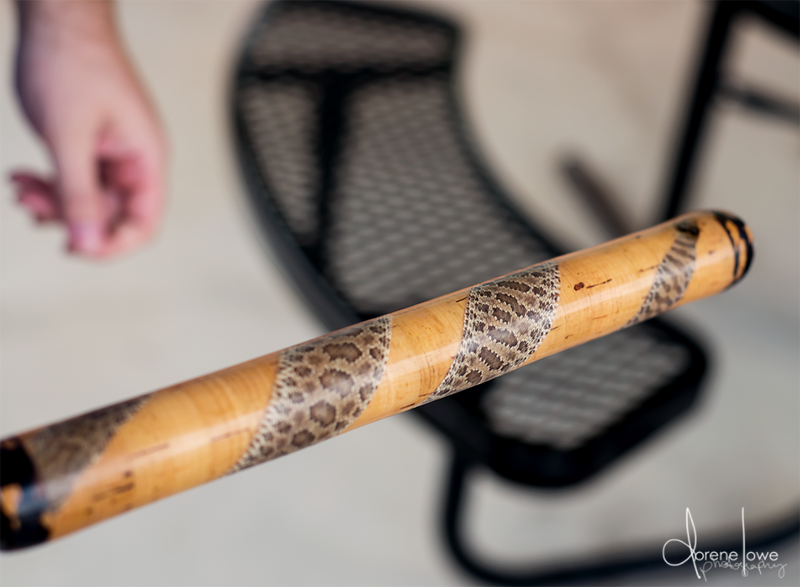 Over those years he has found his signature look – incorporating cork into the rod design. For Kosiba, rod building continues because it’s all about “building the perfect rod,” which has yet been accomplished. A perfect rod, he said would consist of every joint fitting perfectly with flawless, straight guides. Watson said he became involved with the group Mosquito Creek Rod Crafters 15 years ago. He said the group gathers once a month in the Orlando area. “I like the people. It’s a great bunch of people,” Watson said of Mosquito Creek Rod Crafters. As 8 a.m. struck Saturday, Sept. 19, a slew of golf carts exited the Myerlee Country Club with more than 40 golfers eager to participate in the first annual Golf Tournament to benefit Wounded Warrior Anglers – Southwest Florida Region. Ralph Camp, a member of the Southwest Florida Region Chapter and tournament director, said it was a very good day. 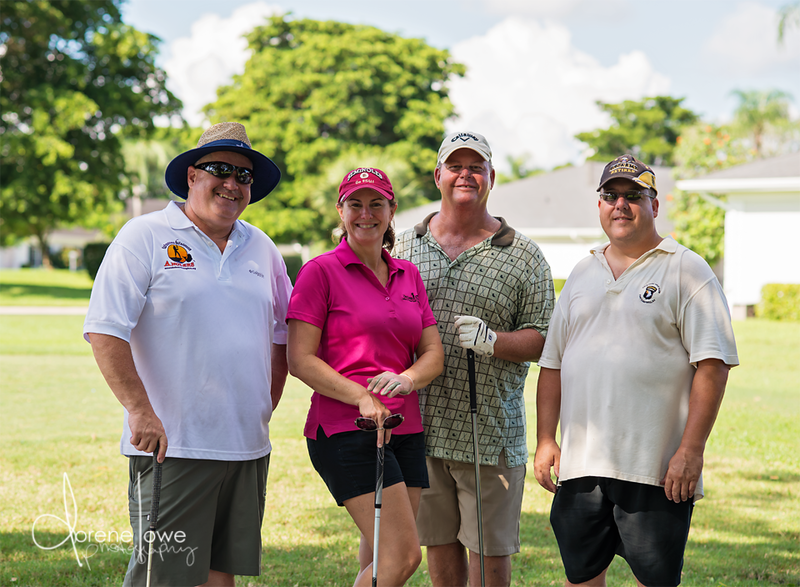 Justin Juha, owner of Bobbin Pools in Cape Coral, was among one of the golfers who showed their support. He said he decided to form a team – Marc Barbato, Mike Danielewski and Tom Ciaverilla – after one of his customers invited him to play in the scramble. Bobbin Pools won first place. The group’s texts began about two weeks ago as the excitement grew about the outing Saturday. 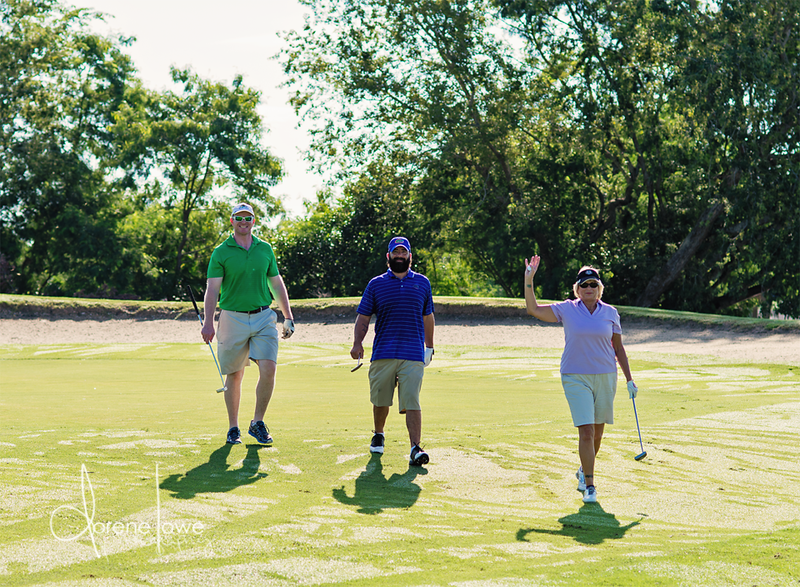 Although they did not know anything about the organization before attending, Juha and his teammates had a blast out on the golf course, knowing they were supporting Wounded Warrior Anglers. Bobbin Pools won first place, a $200 prize, which was donated back to the organization. The second place winners, Team 14, which was comprised of Antoine LaChapelle, who has donated his time to take Wounded Warrior Anglers members out fishing for the past three years, Jeremy Johnson and Jill Dean. Jeremy Johnson, Antoine LaChapelle and Jill Dean won second place. “I like playing golf and I like to participate in any fundraisers for the organization,” LaChapelle said. Wounded Warrior Anglers Board Member Kevin Santos also participated in the golf scramble with his team Coastline Boat Lift Covers with Pete Paskewicz,Tom and Terri Sobeck. Team Coastline Boat Lift Covers won third place, a $60 prize, which was donated back to the organization. She said she thinks Wounded Warrior Anglers is a fantastic organization that does a lot of good for the community. Pete Paskewicz, Terri and Tom Sobeck and Kevin Santos won third place. Prizes were also provided to golfers who hit the ball closest to hole 6, John Tedesco and hole 14, Ann Johnson. Tom Ciaverilla walked away with a prize for hitting the longest drive at hole 4, and Louise Cannizzaro won a prize for hitting a straight drive at hole 9. Camp recruited many volunteers for the golf scramble who helped with the live auction and 50/50 raffle that was set up inside the clubhouse. Those volunteers included Barbara Camp, Mary Kay, Bentley Heylinger, Frank DePace, Rich Laudermilk and Charlie Greenholdt. The live auction generated $730 for the organization. Camp said they sold $185 in mulligans and had $445 in the 50/50 raffle sold before the scramble began. 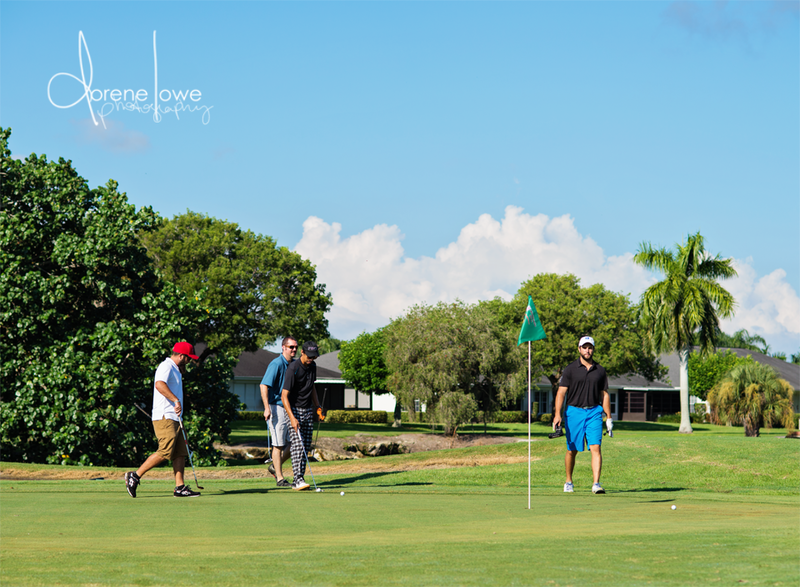 The players also had another opportunity to try their chances at winning the 50/50 raffle after they were done playing the course, increasing the total to $535. LaChapelle won the raffle and donated the money back to the organization. “The donation is just good karma,” LaChapelle said. Ralph Camp and his volunteers. 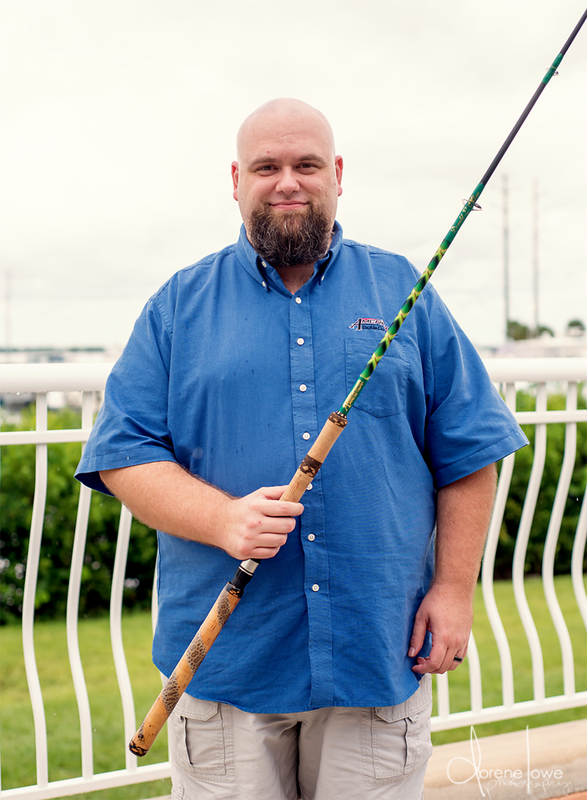 Greenholdt joined the Wounded Warrior Anglers – Southwest Florida Region after moving to Cape Coral full-time almost a year ago after he learned about the organization from his neighbor Camp. The disabled veteran served in the United Sates Army for three years during the Korean War. The Wounded Warrior Anglers became a way for Greenholdt to get to know other veterans, while enjoying one his favorite hobby’s – fishing. Every two months, the Southwest Florida Region chapter pulls two or three membership cards out of a hat for a fishing outing. “It’s a great bunch of guys,” he said, adding that Wounded Warrior Anglers is the only organization he belongs to. 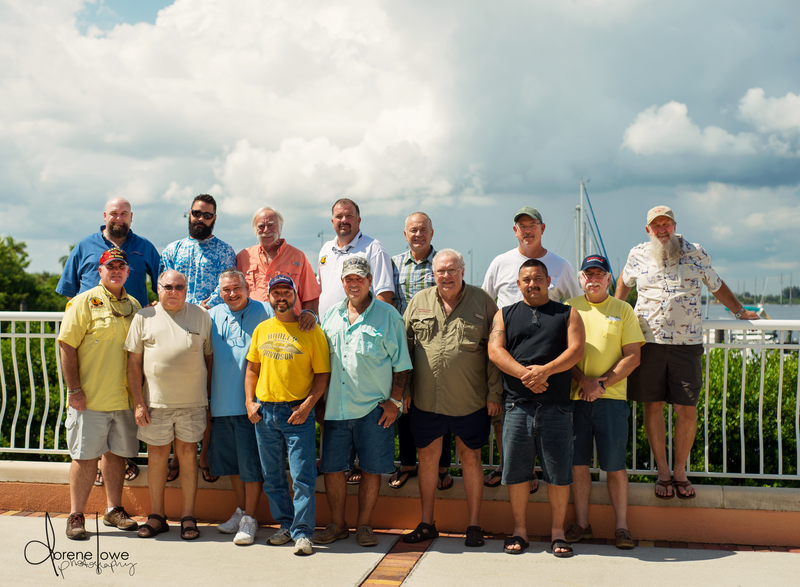 Heyliger joined the Southwest Florida Region chapter of Wounded Warrior anglers on Sept. 15. 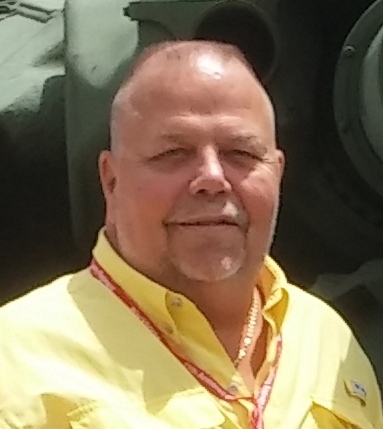 The Army veteran joined the service in March 1976 and retired on March 31, 2015. On Thursday, Aug. 13, the Wounded Warrior Anglers of America board of directors approved three new board members, Keith Campbell, Brad Jessen and Kevin Purdy. The three board members are joining President David Souders, Vice President Judy Souders, Treasurer Tate Hutchinson, Media Director Meghan McCoy and board members Tony Rogers and Kevin Santos. Wounded Warrior Anglers received its nonprofit status in March 2012 after forming the idea of the organization, which began helping veterans in 2010. 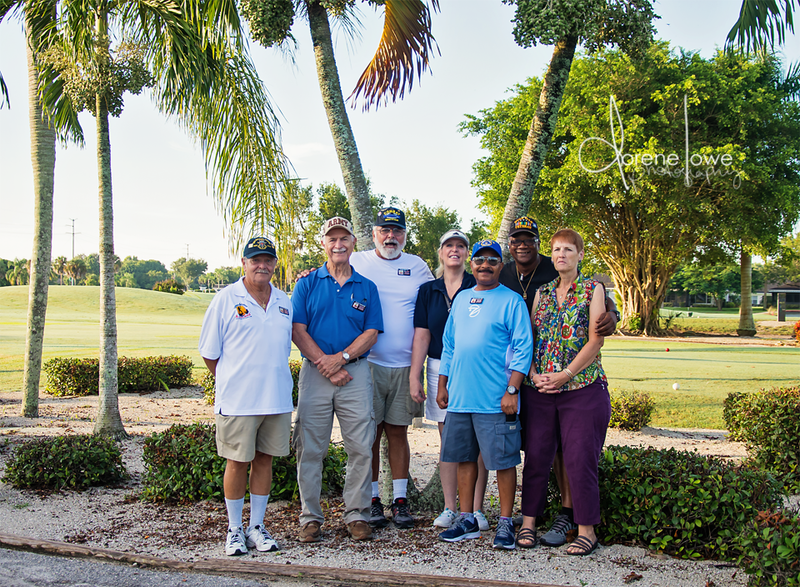 Since its inception, the organization has grown with both its chapters across the state of Florida and through the programs it provides for its veterans and their caregivers. Campbell, owner of Campbell Consulting Inc., moved to Southwest Florida two weeks before Hurricane Charley swept through the area in 2004. Before starting his consulting business he began in the restaurant industry where he managed a family-owned restaurant for 11 years. From there he ran a popular New England franchise for six years. Once Campbell arrived in Florida he began working for corporate 7-Eleven for seven years. After having a conversation with one of the owners from Miceli’s Restaurant in Matlacha, Campbell learned about Wounded Warrior Anglers and decided to attend an event to become more familiarized with the organization. “After meeting Judy and Dave Souders I knew I wanted to be part of it. They are dedicated, humble and have great knowledge about the needs of our vets,” he said. When the opportunity rose, Campbell knew he wanted to submit his resume to be considered as a new board member of Wounded Warrior Anglers. “Although I was never in the military, my father and other family members were,” he said. “I have a heart for our veterans and I feel it’s an honor to support our vets anyway I can,” he said. Becoming a board member is a blessing for Campbell because it provides another way for him to give back to veterans who have done so much for this country. As a board member, Campbell hopes to assist in fundraising efforts, as well as bring more awareness to the organization. “I’d love to see new chapters across the country open to continue the ongoing PTSD support these veterans so desperately need,” Campbell said. Campbell is married to his high school sweetheart of 23 years and has two grown sons. Jessen moved to Southwest Florida in April 2014 after visiting his entire life due to his grandparents moving to the area in the early 70s. Brad Jessen and his wife Kelli. After 21 years in the service, Jessen retired from the Air Force. He spent three years as a mechanic and the remaining 18 years as a flight engineer on the C-5 Galaxy while serving his country. 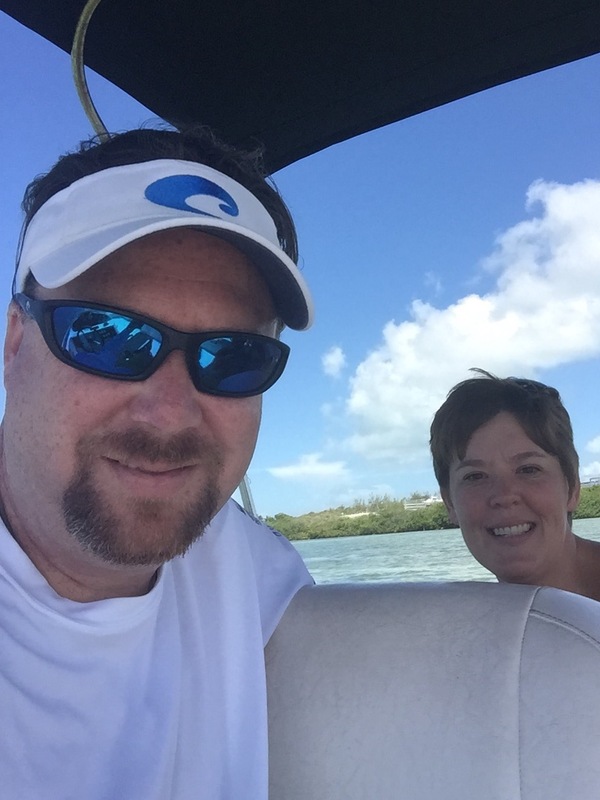 Two years ago he began his second career as a financial advisor representing Edward Jones in Matlacha, Florida. During the fall of 2014, Jessen had the opportunity to learn about the organization after visiting Spa 33 in Matlacha. “As I got to know Tammey and Nadine (both owners of Spa 33), they encouraged me to get involved after they found out I was a disabled veteran, retired from the Air Force,” he said. Once he became involved in the organization, Jessen wanted to make a larger impact for veterans, which is why he decided to throw his hat in the ring to be considered as a board member. While sitting on the board, Jessen looks forward to pursing a greater national presence that has deep seeded relationships serving veterans in need in each community where there are existing chapters, as well as future chapters. His thoughts are “if we can keep out of our own way, there is no limit to where we might take WWA in the years to come.” Jessen said the possibilities are endless with an open mind while keeping everyone’s interest in mind. “I am humbled to be a part of the team of leaders and look forward to where we might go as time moves on,” he said. Jessen has been married to his wife Kelli for 18 years and has two beautiful daughters, Madison, 14, and Riley, 4. 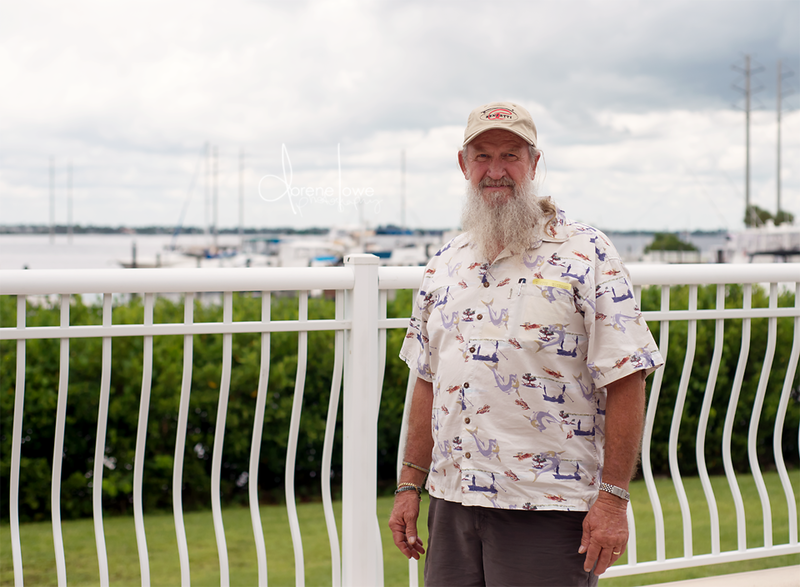 In 2011, Purdy moved to Cape Coral with his wife Heather to help her elderly father remain independent. Although their jobs allowed them to work anywhere in the United States, and the move was supposed to be temporary, they ended up falling in love with the area and decided to make it their permanent home. Purdy is a United States Army veteran that has 30 percent service disability. He joined the service in 1973 when he was 17 years old after quitting high school. He later received his high school diploma from Frankfurt American High School, Bad Hersfeld, West Germany, while he was stationed on the border of west and east Germany in 1976. His career afforded him the opportunity to gain extensive international experience as a business executive. In 2000 and 2001 in China and Brazil, Purdy was responsible for startup development of two assembly plants, as well as assembling a large foundry green sand casting machine to be marketed and sold in Asia and South America. Branch offices were developed in India and Italy by Purdy, as well as expanding the International Sales Agent Network to include 39 countries on six continents. His work also afforded him the opportunity to oversee and participate in industrial trade shows on five continents. The World Foundry Organization was among one of the industry conference panels he was asked to speak at during his career. Purdy also served as a board of director for the Safari Club International Wisconsin chapter from 1994 to 2001. While he served as a board member he witnessed four new chapters being established in Wisconsin in four years. After moving to Southwest Florida, Purdy learned about Wounded Warrior Anglers while the Souders were selling boat raffle tickets for their annual fundraiser at Miceli’s Restaurant. Soon after learning more about the organization, Purdy also wanted to help in a larger way by offering his experience. Purdy sees great things for the organization’s future, which all begins with assisting in the success and growth of the existing chapters. “Of course like many things, it’s good to think in terms of growth, but at the same time we need to assist in the success and growth of the existing chapters as well,” he said. When looking five and ten years down the road, Purdy hopes the organization will reach other regions outside of Florida. “Hopefully in 10 years, our organization can become part of a synergistic network of veteran groups to see that the needs of all veterans and their families are being met in a timely and effective manner,” he said. A Navy veteran of 26 years, Ralph Camp, moved to Southwest Florida a number of years ago from northern Florida. While attending an event in Cape Coral, he met Dave and Judy Souders, the founders of Wounded Warrior Anglers. Camp decided to become a charter member of the organization after learning about its mission. Since joining, he has become an active member of the Redfish Regiment chapter of the Wounded Warrior Anglers of America and has participated in the Warrior & Caregiver Retreat program. Camp also participates in a monthly fishing outing the chapter holds. “It’s a good thing that they do,” he said of the chapter and organization. 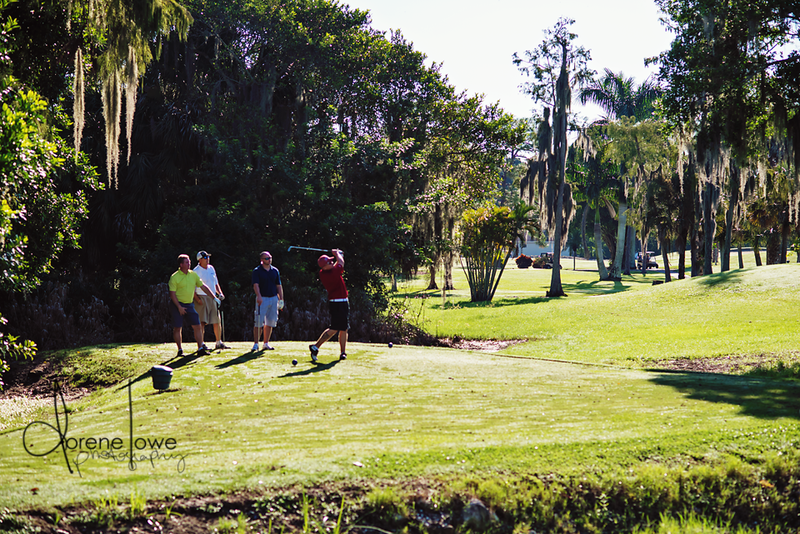 Camp decided to combine his love of playing golf with raising money for the Redfish Regiment. 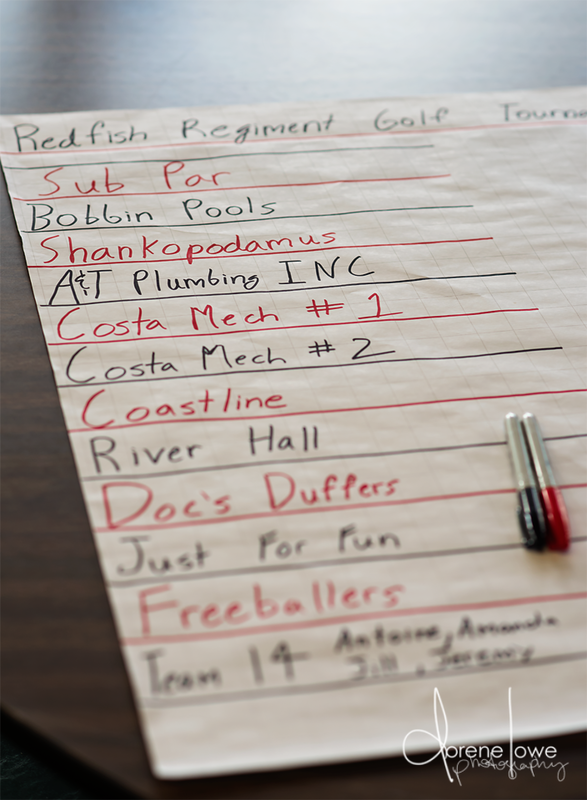 “They weren’t doing anything to directly benefit the chapter itself,” Camp said of the members of Redfish Regiment, which is what sprung the idea of the golf tournament. The 1st annual Golf Tournament will be held Saturday, Sept. 19, at Myerlee Golf & Country Club, 1380 Myerlee Country Club Blvd., Fort Myers. The tournament will have a shotgun start at 8 a.m. The scramble features four member teams competing against each other. 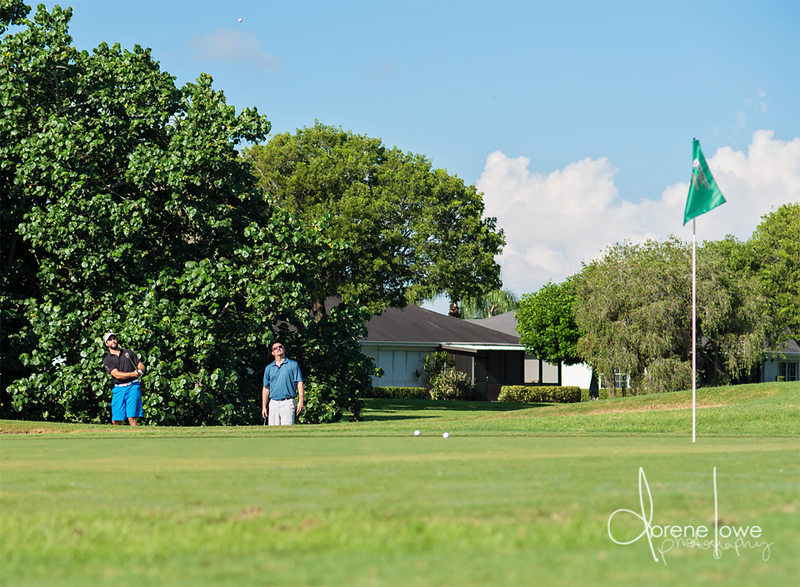 Each team will have the opportunity to hit a golf ball from the tee box before the team member’s choose the best of the four shots for the following shot. The team members then play the second shot from that location before moving on the next hole. Prizes will be given to first place – $200 for the entire team; second place – $100 for the entire team and third place – $60 for the entire team. The country club will provide prizes for the closet ball to the pin at the sixth and fourth hole; the longest drive on the fourth hole and the straightest drive on the ninth hole. Tickets are $40 per person or $160 per foursome team. Although the cutoff to purchase tickets is Tuesday, Sept. 15, if there is not a full-slate of players, Camp said he will entertain golfers the day of the event. Each player will have the opportunity to purchase two mulligan’s if they so desire for the tournament. The players will receive a raffle ticket upon registration for an assortment of prizes, many of which include gift certificates. A silent auction with such items as fishing gear and paintings will also be a part of the tournament. 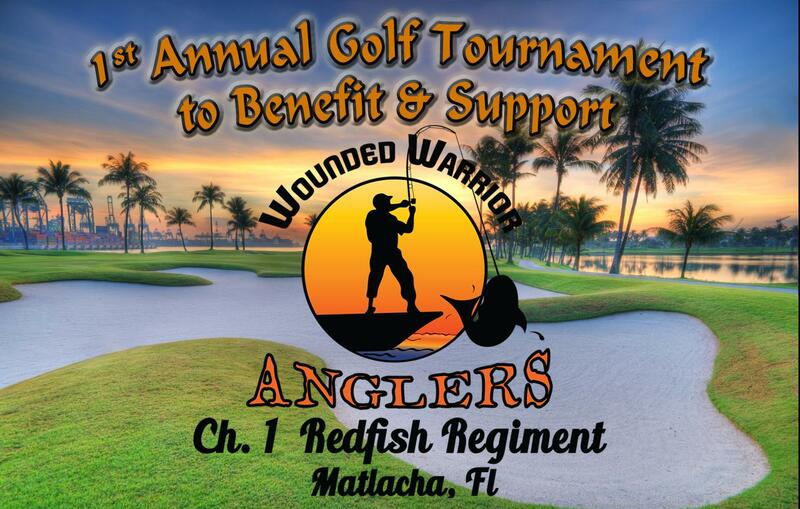 All the proceeds from the golf tournament and the silent auction will go towards the Redfish Regiment. Beer and beverages, as well as food can be purchased from the Tiki Bar. Although Costa Mechanical & Refrigeration is the title sponsor for the tournament, there are many other sponsorship opportunities available. Eagle sponsor is $750 and includes golf for one team of four golfers, cart and greens fee and one team mulligan. The sponsorship also includes the company’s name listed on a sign and one tee box, as well as a tournament flag on one green. One banner measuring 3×5 inches at the clubhouse is also included. The birdie sponsor is $500 and includes one team of four golfers, cart, greens fee and one team mulligan. It also includes a company or family name on a tournament flag on one green. A banner measuring 2×3 inches at the clubhouse is also included. Tournament flag sponsors are $150 for company or family names. The flag will be placed at one of the greens. 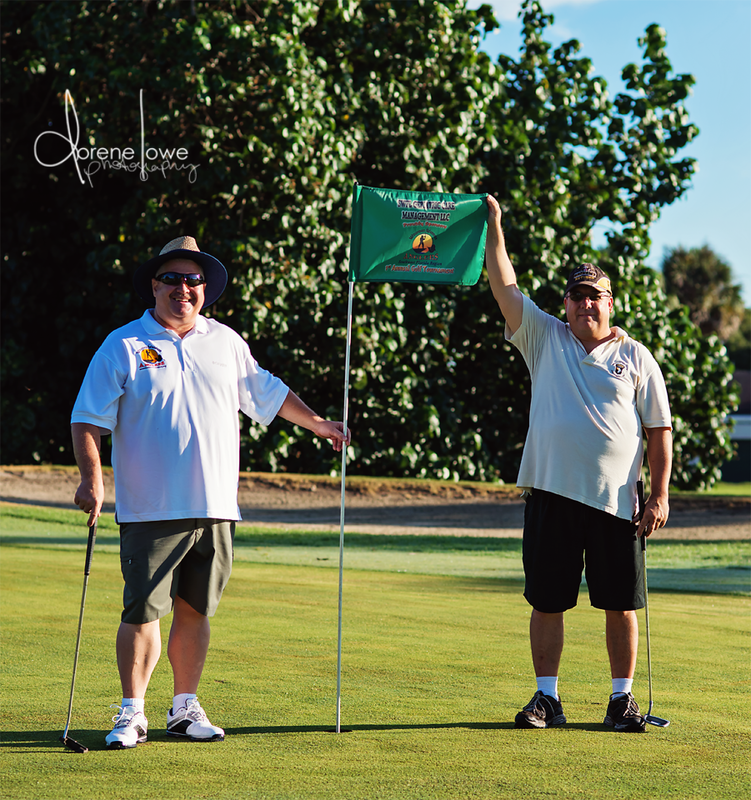 The tee-box sponsor is $100 for company or family names on a placard at one of the tee boxes. For more information, contact Camp at (239) 257-5848, or email mcporalph@Hotmail.com. Wounded Warrior Anglers of America, Inc.